This best-selling author’s books always “come in the back door” to explore what’s beyond the “why” of our mysterious existence called life. Short-circuiting the ruts of the usual routes of inquiry, he brings our minds to a halt that permits a new understanding to enter. “In a world where content is just the vehicle for commerce, commerce the means to wealth, and wealth the expression of our value, we have come to feel that our lives are without purpose, without connection, without grounding. This world of separation is maintained by the motion of our lives, perpetuated by the distractions and busyness that ultimately translate into a life of tremendous stress.” This book gives access to the alternatives in a direct, informal approach, beginning with the unsatisfactory answers we’ve accepted to our dilemmas and finding out what the real questions should have been. 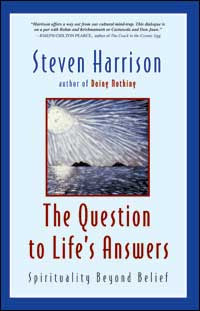 In this original and inspiring work, Steven Harrison lays bare the workings of the mind with brilliant clarity. Grappling with the questions we all have about life, he deconstructs the prevailing spiritual, therapeutic, and self-help methods we use to try to change ourselves. By taking this journey of exploration with him, we come face-to-face with the unknown and the potential for radical transformation.